Iquitos is the largest city in the rainforest of Peru. It is the capital of the Loreto Region and the Maynas Province. Located on the Amazon River, it is just 106 meters above sea level even though it is more than 3,000 kilometers from the mouth of the Amazon on the Atlantic Ocean. It is situated 125 km downstream of the confluence of Rio Ucayali and Rio Mara�on, the two main headwaters of the Amazon River. Iquitos has long been a major port in the Amazon Basin. It is surrounded by three rivers: the Nanay, the Itaya, and the Amazon. The city is generally considered the largest in the world that cannot be reached by road, only by airplane or boat - unless you're travelling from Nauta, a small town roughly 100km south. Most travel within the city itself is via bus, motorcycle or mototaxi (auto rickshaw). Transportation to nearby towns often requires a river trip via llevo-llevo, a small public boat. The climate is hot and humid, with an average relative humidity of 85%. The wet season lasts from around November to May, with the river reaching its highest point in May. The river is at its lowest in October. Iquitos has a growing reputation as a tourist community, especially as a jumping-off point for tours of the Amazon jungle and the Pacaya-Samiria National Reserve, and trips downriver to Manaus, Brazil - the other rubber-industry city in the interior of the Amazon basin - and finally the Atlantic Ocean, which is 3,360 kilometers away. Book a Jungle trip in Per� the perfect ocasion to relax and enjoy nature. A boat tour of Belen is common tourist attraction. Belen is an area of Iquitos that can be accessed by foot in the dry season but is only accessible via boat in the wet season. Many of the homes in this area are tethered to large poles and float upon the rising waters every year, and some homes float year-round. Where the waters begin there are often a few men with their boats who tranport locals and tourists for a small fee. Manu national park tour is very interesting and amazing. There is also an open-air market in Belen (a part that doesn't flood). This too is a common tourist attraction. Most notable is the medicine lane, an entire block of the market, on both sides, lined with local plant (and animal) medicines (everything from copaiba to chuchuwasai). During the 1990s, homosexuals fled the repressive police in other cities of Peru to live in this frontier town. Many now live in Belen. It is served by the CRNL. FAP. Francisco Secada Vignetta International Airport. Explorama Lodges began operation in 1964 and since this time the company has always felt an obligation to purchase and maintain primary virgin rainforest reserves near each of its Lodges. All original managers and stockholders of Explorama had been high school or university teachers prior to starting the company and this has always given the enterprise a strong emphasis on education about the rainforest, for employees, our guests, and the local ribere�os or river people. Located along the right bank of the Amazon River-20 miles from the city of Iquitos, the circuit requires an hour to reach the hostel by fast boat. Its primary facilities in line with nature are protected and prevent entry of insects, which have been designed to provide the necessary comfort to our visitors in direct contact with nature, lighting at night with kerosene lamps and night tours , battery lanterns. We have reception room, dining room and bar where you can enjoy cold drinks, House hammocks for relaxation. House of crafts and games room, 20 rooms including doubles, triples and quads all with standard bathroom connected by a passageway off the ground one meter in height. Trekking through the jungle knowing flora and fauna. 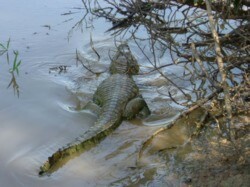 Canoe-night excursion Ability to observe caimans. Recreational fishing of piranhas and other species. Visit the native group Yagua .- Clothing, dialect, crafts, lifestyle. Canoe by a black water tributary - Landscapes-walks. From the hot city of Iquitos, located at edge of the majestic Amazon river, Our pleasure present a new alternative to get to know the majesties of tropical Amazon jungle. Our lodge have private bungalow natural material that will give to you the needed comfort during your stay. We have the privilege to navigate on the water of the majestic Amazon river, the longest and most tumultuous river in the world and his tributaries. Our quality personal can show the variety of medicinal plants there are in Amazon jungle, where use the river side people and the natives, including the mystic and hallucinogenic ayahuasca. Come with us to share this wonderful experiences, we wait for you, and will be welcome! Our tours are within Samiria National Reserve, located in the department of Loreto, which was created with the objective of conserving representative ecosystems of the forest and preserve their genetic diversity, protecting flora and fauna species in other areas of the Amazon have disappeared. For its size is the largest, the second of the Amazon Basin and the fourth in South America. The reserve is home to 102 mammal species, 449 bird species, among others. Pacaya Samiria Amazon jungle expeditions Lodge provides primary, pink dolphin, mammal and bird watching, night excursions in search of lizards and nocturnal species, visit the confluence of the Ucayali and Maranon rivers, where the river Amazon, visits riparian communities, encouraging their participation in tourism activities. We also offer programs for birders, including visits to the Allpahuayo Mishana, where endemic birds can be sighted.